We believe the difference is in the details. 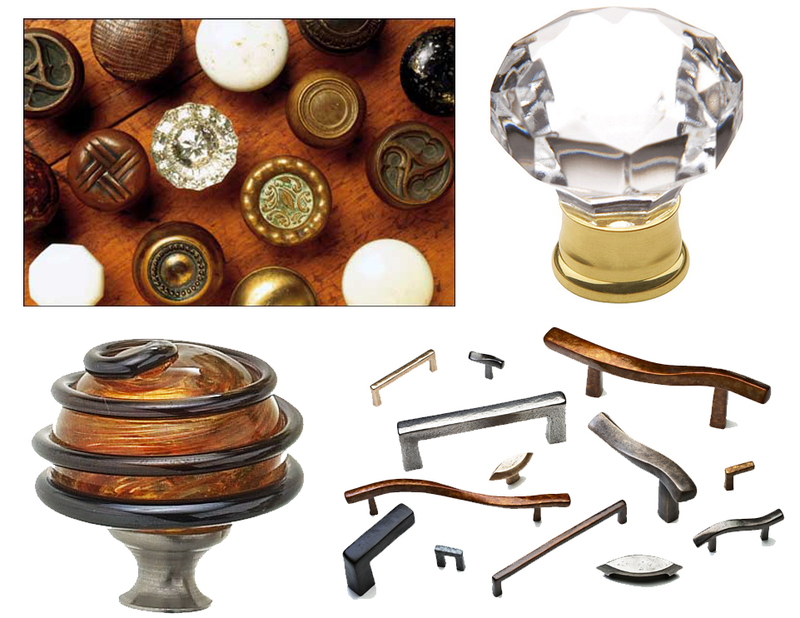 After all, a knob or hinge is more than just a knob or hinge – it’s jewelry for your home – the perfect accent to your home’s design aesthetic. Adding or changing out decorative hardware can be one of the easiest and most inexpensive ways to re-vamp a dull kitchen or add interest to an old piece of furniture. 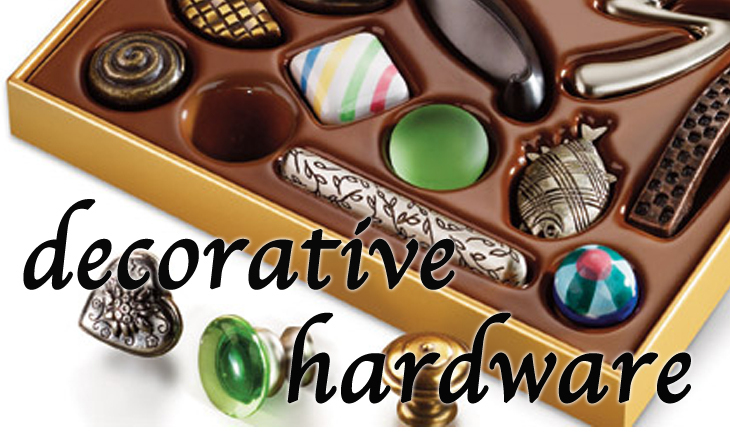 There are thousands of shape, finish, and style options offered by hundreds of hardware manufacturers. 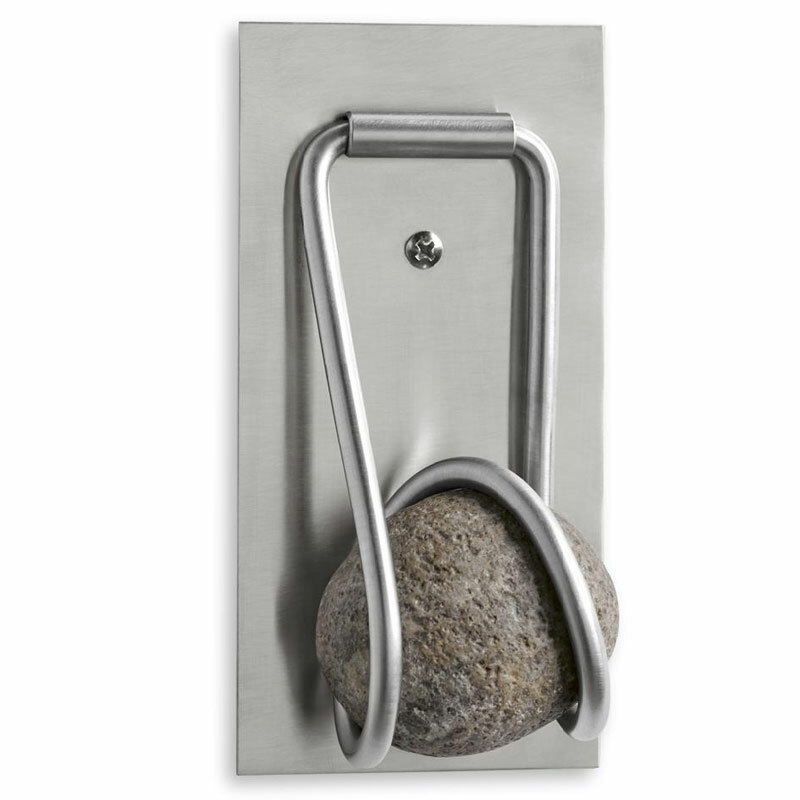 Wether you are looking to add a simple stainless steel lever or some “bling” with crystal knobs, the new trends and innovations in decorative hardware will certainly inspire you. These dazzling Susan Goldstick decorative pulls are the perfect mix of art-deco and glamour. The bright colors fall perfectly into our Rock Candy color collection for 2013, check it out here. Does your home have a specific design focus or theme? The hardware shown on the left would be perfect for a beach house or coastal property where the hardware on the right would be a wonderful addition to any mid-centruy design style. The overall goal is to accentuate the architectural details of your home in order to create a consistency in style and design throughout. We can not forget that decorative hardware starts at the front door and sets the tone for the rest of the finishes in the home. As our first encounter of any interior is the result of our entrance into it, a movement from outside to inside. Long before the doorbell, homeowners hung door knockers on their entrance doors. Door knockers have a long history — they have probably existed as long as houses have had doors — but it wasn’t until the Middle Ages that door knockers became a fanciful house accessory. The Renaissance awakened an interest in art and design, and door knockers grew more ornate. 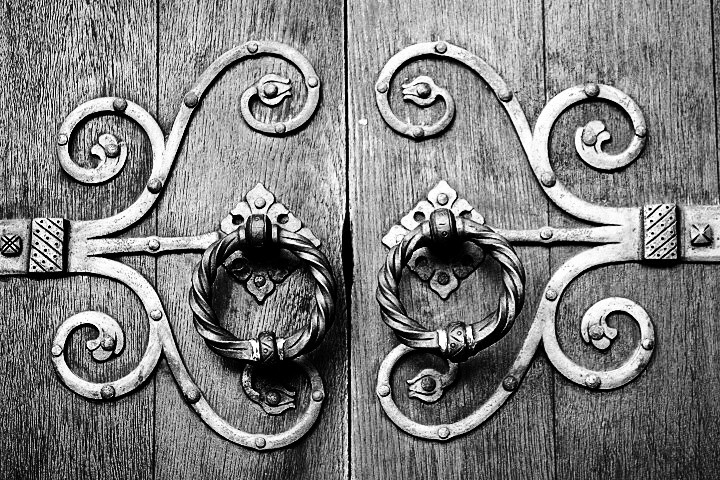 Once constructed of pounded iron, knockers were cast in delicate shapes and figures in iron and brass for the doors of the wealthier members of society. 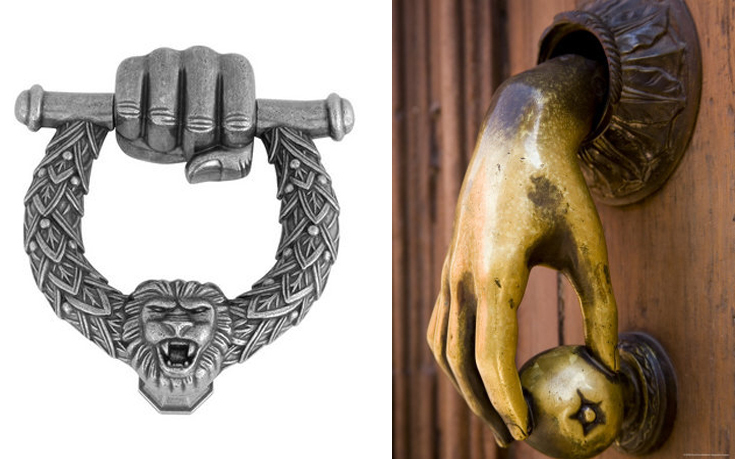 The door knockers in general use today are the Georgian urn or vase, the thumb latch, and the eagle. Such designs as Medusa’s head, and the head of Daphne with its wreath of laurel leaves are also sometimes found. Below are some innovative door knockers that are post worthy! 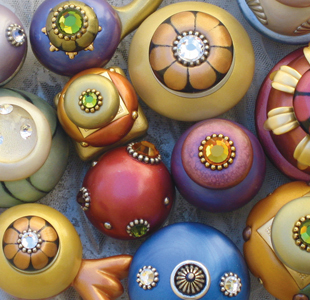 These hand and ball knockers are a funky twist on an old-age concept. 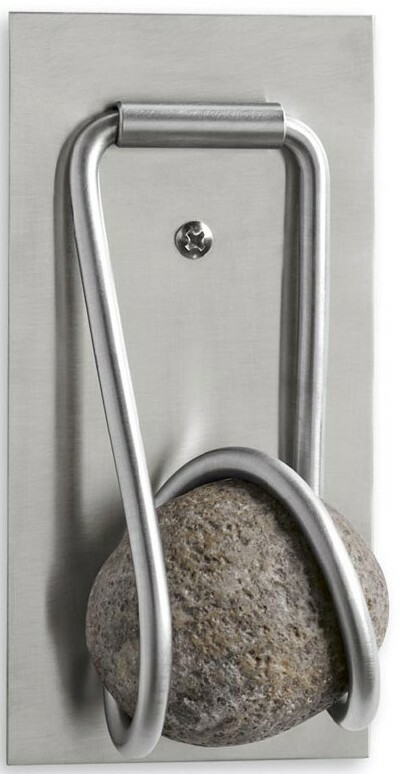 Here is a door knocker with a modern twist, literally!! 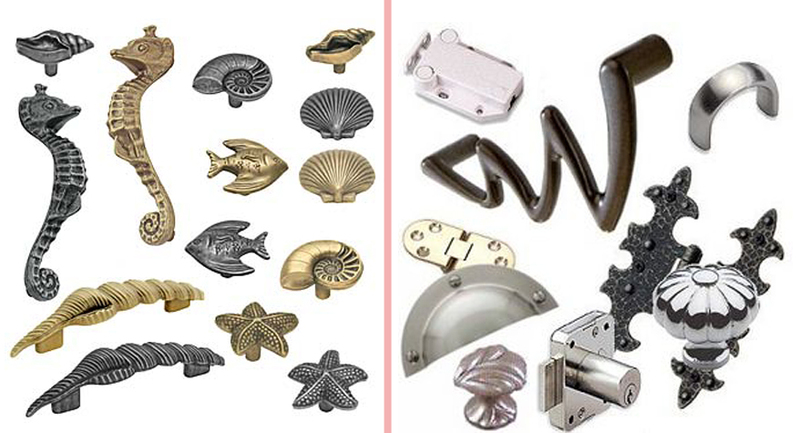 Decorative hardware has given the world of design a lot to be thankful for and we have only scratched the surface. It’s history is an unwritten book and it’s future holds endless possibilities! What are you thankful for today?? Now that all the candy is gone and the witches have finished their brew, it is time for November, time to say Thank You!!! This is the month everyone sits and thinks of all they have to be thankful for. 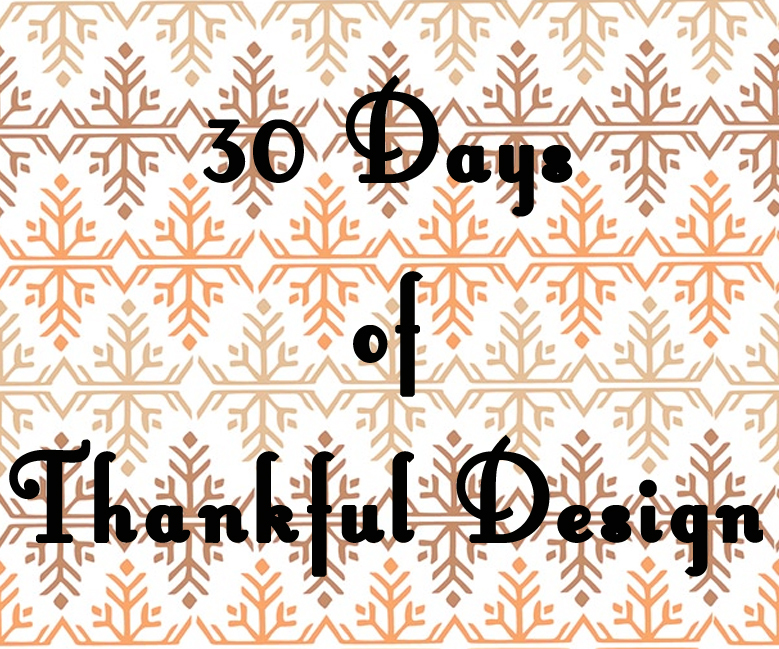 Since this is a blog about design and fashion, we thought we’d give you a daily design element we are thankful for through out the month of November. Our first daily dose of design features a pattern derived from nature and emerging as a re-newed trend and focal design element. Honeycomb is a mass of geometric cells built in bee nests to store honey. The motif of hexagonal shapes come together like puzzle pieces which makes it a fabulous option for repeating patterns or pulling apart into single geometric shapes. We love how versatile this pattern is – from elaborate decorative ceiling trim to a small detail on a decorative pillow, the honeycomb pattern is the perfect mix of art and nature. 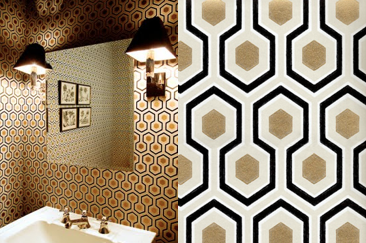 As you can see in the pictures below, you can implement this geometric pattern in any type of space. 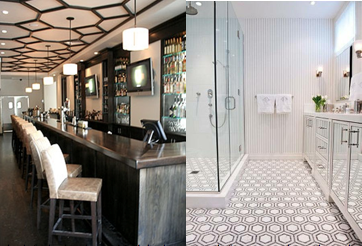 The use of the honeycomb pattern in the left picture creates a visual interest on the ceiling and draws the eye up, while the bathroom on the right shows how creating a simple, repetitive pattern on the floor can make the space feel larger. Both are great ways to add visual interest to a narrow space. Wall coverings are another way to tie in this geometric pattern. Like this vintage gold leafed David Hicks wallpaper. Gorgeous! 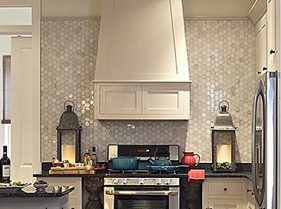 This kitchen uses the honeycomb pattern on the feature wall. Paired with the metallic shimmer of the tiles, a fabulous focal wall is created. 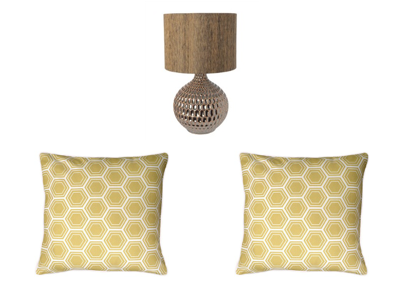 As we all know, trends are constantly changing and evolving – the honeycomb pattern is no different. So, if you are looking to keep up, but not be tied down, then accessories are the way to go! 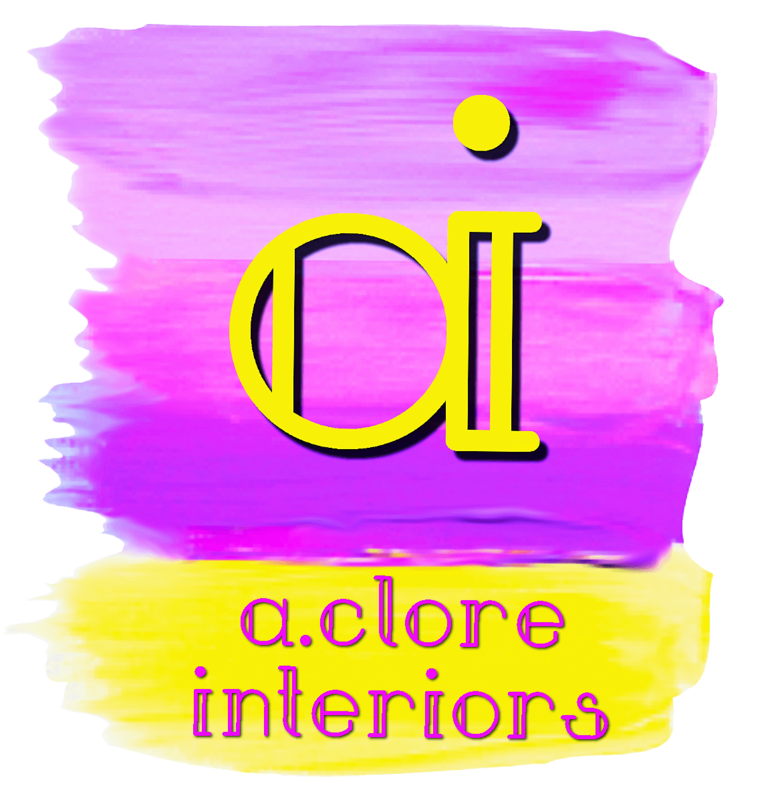 Below are a some fun accent pieces that can take a room from drab to fab in a snap! Above are some DIY honeycomb shelves that work great for wall art or an unconventional way to display your favorite novels. 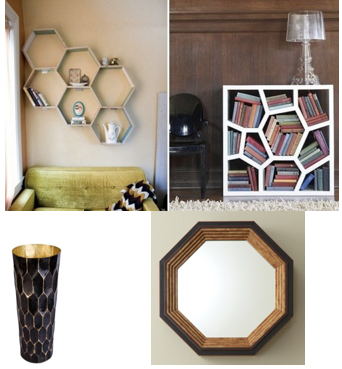 A funky vase, mirror or lamp with some geometric detailing are other simple ways to bring in the honeycomb pattern. Always keep in mind that throw pillows are a fun way to bring in a bold pattern with little commitment. As you can see, the honeycomb pattern has given us plenty to be thankful for. Weather you are re-designing an entire room or just looking to add a “sting” of drama to existing decor, this geometric design is a great way to go. So, as this first day of November comes to an end, we leave you with the buzz-ness. Until tomorrow my friends, stay “buzzy”! !